Mr. Cakestein (a.k.a. Blitzen) relaxes on a grass lawn in Providenciales, Turks and Caicos. 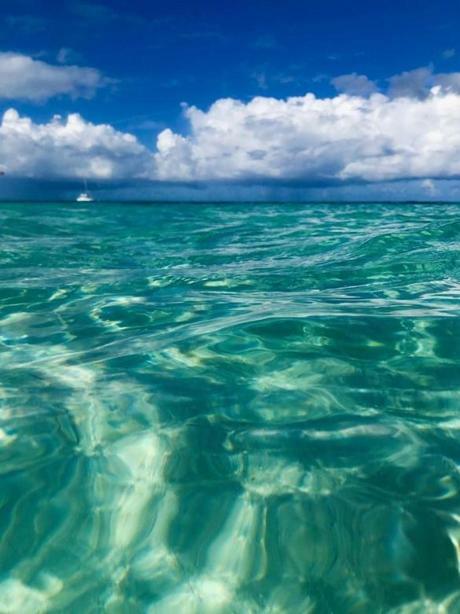 PROVIDENCIALES, Turks and Caicos — The sand was warm, smooth, and the color of pale corn silk. The sky was bluer than Chris Pine’s eyes, and the tranquil water was warm, but still cool enough to be refreshing. Mr. Cakestein wanted none of it. “What do you think buddy? Should we hit the beach?” I asked. He looked at me silently, then looked away. I tried again. He planted himself on the sidewalk in a manner that indicated if I wanted to go to the beach, I would be going solo. I took a breath and remembered that Mr. Cakestein was not with me for my amusement. Nor was he an accessory. He was a puppy in my care. I went to Potcake Place , a nonprofit dog rescue in Providenciales earlier that day and agreed to care for him as part of the rescue’s wildly popular program allowing visitors to take dogs out in the morning for two hours of exercise and socialization. 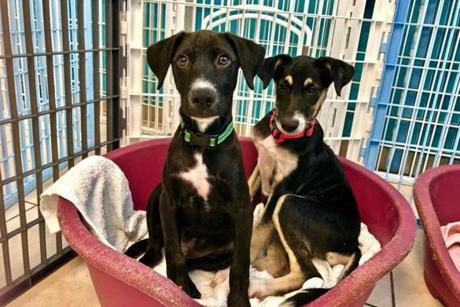 The idea of taking these adorable potcake puppies to the beach, especially the inviting beaches of Turks and Caicos, has been romanticized in viral videos and stories that have dubbed the Turks “puppy island.” It’s become so popular that some mornings a line starts forming two hours before the rescue opens with tourists eager to spend time with the dogs. But Potcake Place is not in the business of loaning out puppies just for the sake of Facebook and Instagram likes. Its ultimate goal is to find homes for the dogs. Roughly 500 of these puppies are adopted by loving families, mostly from the US and Canada, each year. I took my responsibilities very seriously. 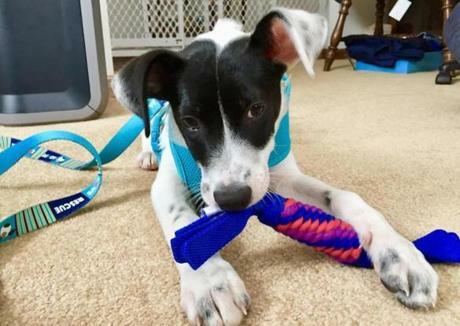 The puppy in my charge was rescued by Potcake Place around Christmas and was therefore christened Blitzen. I thought he was deserving of a year-round, sophisticated name, so I dubbed him Mr. P.T. Cakestein as an homage to his breed. He was exceedingly well behaved, allowed me to cuddle with him, and was friendly to every passing stranger. If you want to make friends and influence people on Turks and Caicos, walk a potcake around town. We walked until Mr. Cakestein found a patch of grass, dropped, rolled around, and decided he wanted to play. So be it. We played on the lawn. I suspected he was probably sick of going to the beach every day. 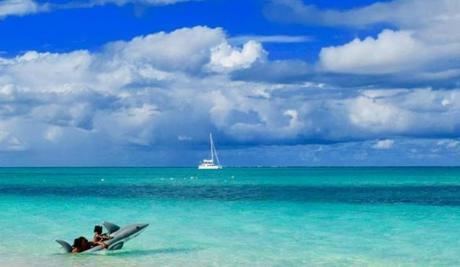 Vacationers ride an inflatable shark on Bight Beach in Turks and Caicos. 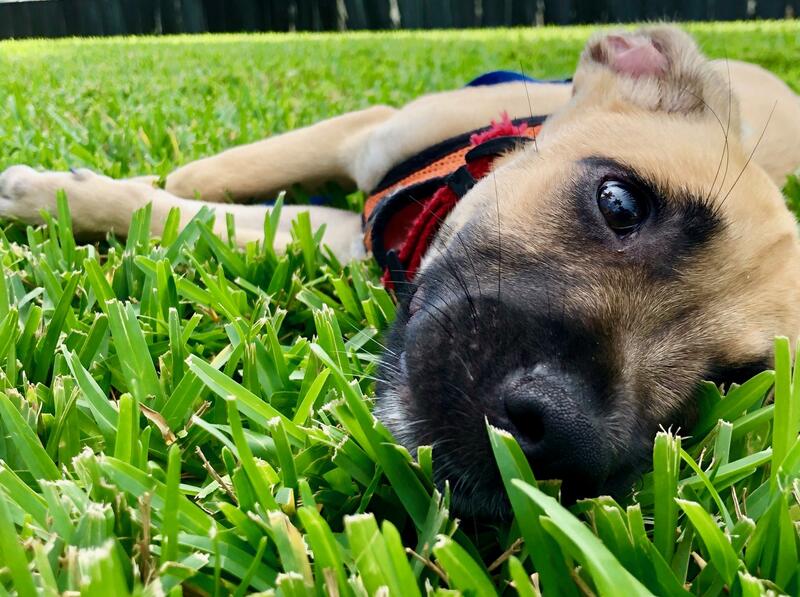 Potcakes are a breed of dog found on Turks and Caicos and the Bahamas. They were given the name because families would feed the dogs the congealed remains of their meals found at the bottom of pots. For decades, locals thought of the dogs as a nuisance. They were, and in many cases still are, strays that existed on trash and scraps. Parker-Rauw is the fairy dog mother of Providenciales. The afternoon I was scheduled to talk to her she was suddenly called away to pick up a litter of puppies that had been found deserted in a box by the side of the road. She’s been at it since the late 1990s and has saved thousands of dogs. The rescue’s current location, a small space brimming with puppies, opened in 2011. The origins of Potcake Place and the ensuing viral puppy island mania can be traced back 15 years to a dog named Tommy Brockett. Parker-Rauw received a call that people were throwing rocks at a puppy in the street. She got in her car, rescued the shaking dog, and brought it to the vet to be examined. As the vet prepared to euthanize the dog, Parker-Rauw decided a death sentence for the black puppy with a white stripe down its face, pert ears, and a white tip on its tail was entirely unjust. Instead, she took the dog home. Two days later she received a call from her property manager. He heard Parker-Rauw was fostering dogs. His wife was looking to adopt a very specific type of dog: Black with a white stripe down its face. Parker-Rauw was elated. Fifteen years later, the dog that was the victim of a stoning is living in North Carolina. Parker-Rauw still receives photos. The rescue, which is completely staffed by volunteers and funded by donations, is often buzzing with couples and families either looking at the puppies, or getting serious about adoption. While I was putting Mr. Cakestein in his harness for a walk, a couple that had traveled all the way from Vancouver was filling out adoption paperwork. Many of the dogs find homes in cities that offer direct flights to Turks and Caicos, such as Boston. Don’t arrive in Turks and Caicos thinking you’ll be returning with a canine souvenir. Parker-Rauw carefully screens applicants to make sure their intentions are true. She calls the family’s veterinarian to find out its history with dog care and uses her finely tuned internal radar to decide whether an applicant will be a suitable dog parent. She said she doesn’t want the dog to end up in a shelter in the US or Canada. Condon said he and his wife didn’t go to Turks with a plan to adopt a dog, but they took Bandit for a walk and his wife instantly fell for the dog. Bandit, who was adopted by Travis Condon and Ashley Robbins, has found a home in Leominster. Now Bandit, who was rescued from under a deck, lives in Leominster with the couple’s other dog, Ollie. The view of a distant boat from the white sands of Bight Beach. Aside from the program to help give potcakes a better life, what I found heart-warming about the trip to Turks and Caicos was how quickly this British Overseas Territory recovered from Hurricanes Irma and Maria in the fall of 2017. The notable changes were a dearth of tall palm trees, the permanent closure of the conch farm, and a few gas stations with missing signage. I stayed at two resorts during my time on the islands. The posh, five-star Wymara, with stellar onsite dining options, was the splurge. Rates start at $955, but I thought the comfortably modern rooms, chic pool, and adjacent beach were worth the price. I started the trip staying at the much more budget-conscious One on Marlin (rates starting at $294 a night). The resort is located inland, so a car is a necessity, but if you’re planning a DIY, beach-hopping vacation, it’s a good option. My room was large and private with a full kitchen. Nothing is inexpensive in Turks and Caicos, but you can find Airbnb rentals under $200. After several meals of conch fritters, cracked conch, and conch chowder, it was important for me to engage in a non-conch activity. I managed several — including a ferry to North Caicos — but from the time I arrived in Turks and Caicos, I had my eye on Chalk Sound National Park. Chalk Sound is a spectacularly turquoise lagoon dotted with tiny cays. On a peaceful Sunday afternoon I rented a kayak at Las Brisas Restaurant and Bar and paddled out without a plan or agenda. After traveling for what I determined was long enough to have worked off at least six conch fritters I decided to drift aimlessly. There were many more exciting activities on the island than drifting in a kayak in the middle of the lagoon, but at that particular moment I could think of none more appealing. I had found my blue heaven.